South African Airways (SAA) is again looking at opportunities for new partnerships and network expansion. SAA is now re-engaging with Etihad following an unsuccessful initial partnership and is keen to launch new routes after the delivery of its first two A330-300s in 4Q2016. Any growth, however, is unlikely to be profitable until SAA addresses its longstanding challenges. The airline has still not fully implemented its previous turnaround plan and urgently needs yet another capital injection. A full and deep restructuring is required but seems impossible in the current political environment. Repeated government meddling has put SAA in an extremely challenging situation. The airline is in dire straits, and its outlook remains bleak. Since this report was produced, African LCC group fastjet announced the appointment of Nico Bezuidenhout as CEO, effective 1-Aug-2016. He is currently CEO of the successful SAA subsidiary LCC Mango, a position he has occupied for a decade, since the founding of the airline. Mr Bezuidenhout over the last three years also had two stints as acting CEO of SAA. Mr Bezuidenhout joins a long list of SAA executives who have resigned in recent months, including director Anthony Dixon, Chief Financial Officer Wolf Meyer, Chief Strategy Officer Barry Parsons and EVP for the Americas Marc Cavaliere. Mr Cavaliere, who was previously the head of global sales development and alliances and is still serving out his notice period with SAA, Mr Bezuidenhout and Mr Parsons were key figures in developing the SAA restructuring plan. SAA has had seven acting or "permanent" CEOs in the past four years, under controversial Chair Dudu Myeni, a close friend of the South African President Jacob Zuma. SAA has been in an almost constant state of restructuring for the last decade. There have been several turnaround attempts and a long succession of CEOs. The most valiant restructuring attempt was initiated in 2013, when SAA’s previous management team put together a new long-term business plan. Several components of the plan were successfully implemented, including the suspension of three highly unprofitable long haul routes. However, management ran into roadblocks in implementing other key components of the business plan – including a new partnership with Emirates and the acquisition of new widebody aircraft. Over the past year nearly the entire SAA management team has left. Political bickering, stand-offs and uncertainty have impacted SAA, making for an undetermined future. For now, SAA is only able to focus on the short term. SAA still desperately needs a viable long-term business plan, but such planning is virtually impossible given the current political situation. 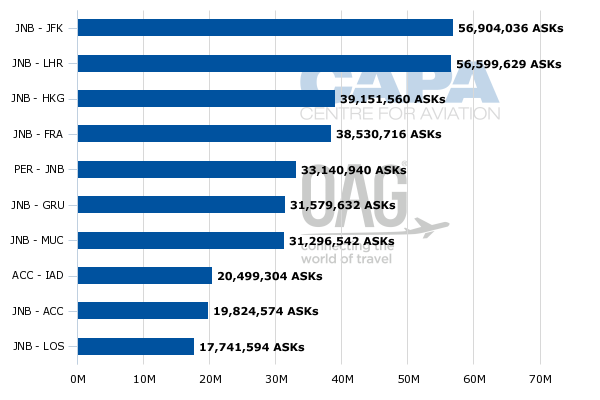 On the network side, SAA needs to make quick decisions as it is committed to taking two A330-300s in 4Q2016. Both these aircraft are for growth, and will expand SAA’s widebody fleet to 25 aircraft. On the partnership side, SAA is reconsidering its relationship with Etihad and exploring options for working regionally with other African airlines. It is also seeking to enhance relationships with other Star Alliance members to improve its global reach. Such partnerships can be forged and implemented relatively quickly – even in the current uncertain environment. SAA initially forged a codeshare partnership with Etihad in May-2013, covering 12 routes beyond Abu Dhabi. The partnership was expanded in Mar-2015, with SAA launching services alongside Etihad on the Johannesburg-Abu Dhabi route and the number of codeshare destinations beyond Abu Dhabi increasing to 32. At the same time SAA dropped services to Mumbai and started relying on Etihad to provide offline access throughout India. However, the expanded partnership with Etihad quickly proved to be unsuccessful. SAA struggled to secure seats beyond Abu Dhabi and its Johannesburg-Abu Dhabi flight was highly unprofitable. SAA suspended services to Abu Dhabi in Mar-2016, only a year after the route was launched, and in Feb-2016 stated that it was terminating the codeshare with Etihad. The Acting CEO of SAA, Musa Zwane, told CAPA on 2-Jun-2016 during the IATA Annual General Meeting that SAA is now discussing a potential new partnership agreement with Etihad. Initial talks took place during the IATA Annual General Meeting in Dublin. Mr Zwane said that although SAA gave notice to Etihad that it was pulling their codeshare it had not yet suspended the codeshare, and Etihad has since asked SAA to reconsider. SAA is not keen to continue with the original codeshare agreement as Mr Zwane considers it to be one-sided. However, the relationship with Etihad can be maintained and potentially expanded if a new, more favourable, deal can be forged. Mr Zwane said that SAA would also be interested in opening new talks with Emirates. SAA and Emirates have had a long-standing but limited codeshare arrangement covering the Johannesburg-Dubai route. SAA and Emirates agreed to a new comprehensive partnership in 2015; they were literally hours away from signing and announcing the deal at the 2015 Paris Air Show before SAA board approval was rescinded at the last minute. The Emirates deal was an important component of the last turnaround plan as it would have provided SAA a much stronger global offline network than can be achieved with Etihad, and/or a combination of other new partnerships. Most crucially the deal included a rare revenue guarantee from Emirates, which would have enabled SAA to avoid repeating the problems experienced with its Johannesburg-Abu Dhabi flights. Despite its crucial role in SAA’s long-term strategy and future, the prior SAA management team was stunningly ordered to call off the planned signing of the deal in Jun-2015. SAA is now hopeful that it can relook at the proposed Emirates partnership. However, it seems unlikely that Emirates would be willing to return to the negotiating table – or again offer a revenue guarantee – following the disappointing last minute rejection from SAA in Jun-2015. Emirates hardly needs SAA, particularly given SAA’s current relatively weak position. Emirates is now by far the largest foreign airline in the South African market, with over 36,000 weekly seats to three destinations. Emirates also now has more capacity to and from South Africa than SAA’s entire long haul operation. Following the suspension of Abu Dhabi, SAA has only approximately 31,000 weekly seats to eight long haul destinations – Frankfurt, Hong Kong, London Heathrow, Munich, New York JFK, São Paulo, Perth and Washington Dulles. All eight of these cities are served nonstop from Johannesburg except Washington, which is served via Accra in Ghana and Dakar in Senegal. There has been talk in recent months of new long haul routes, including Chengdu in China. SAA dropped Beijing in Mar-2015 and is now working with Air China, which launched services to Johannesburg in late 2015. Suspending Beijing, which was highly unprofitable and was initially launched for political rather than commercial reasons, represented a major step forward in SAA’s restructuring. Any new Chinese route would likely have a political motive and would be nearly impossible to sustain. In fact the launch of any new destination outside Africa would be a step in the wrong direction, given the challenges that SAA faces in the long haul market and its current situation. SAA is looking primarily at expansion within Africa, where it has pursued steady and generally profitable growth over the last several years. SAA currently serves 40 regional international destinations but has only eight destinations outside the continent (as previously mentioned in this report). 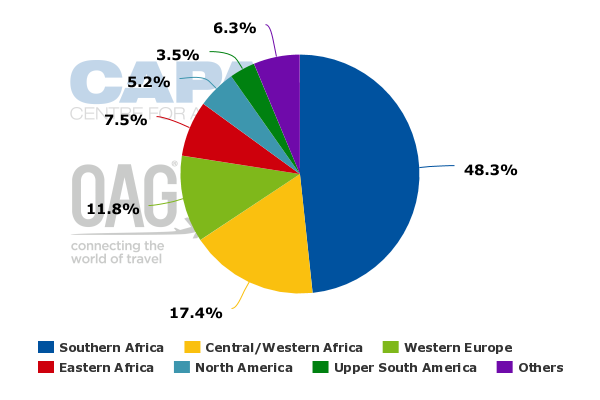 Approximately 73% of SAA's seat capacity is now allocated to regional routes within Africa. However, at times Africa expansion has also been pursued for political rather than commercial objectives. 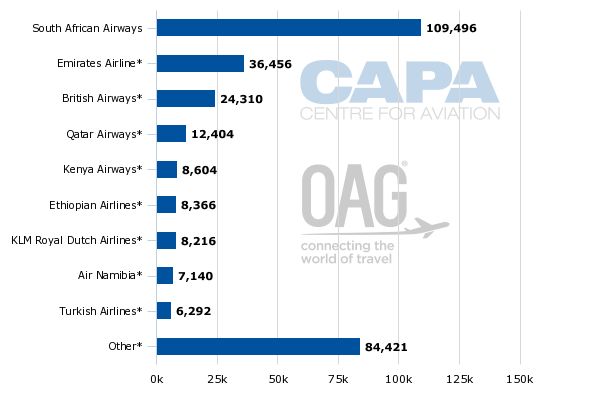 Regional international services within Africa currently make up the only profitable portion of SAA’s network. However, the regional international market has become more challenging due to intensifying competition and weaker demand on some key routes, due to the decline in oil prices. SAA faces new competition on several of its most profitable regional international routes. fastjet is particularly a threat and now competes with SAA on three international routes from Johannesburg. fastjet expansion in South Africa is likely to accelerate after Mr Bezuidenhout joins the LCC group. Mr Zwane said that SAA is now preparing for further regional growth within Africa – made possible with its new A330-300 fleet. In 2015 SAA converted its last 10 A320 orders to five A330-300s. The conversion – another component of the prior turnaround plan – was sensible, as SAA does not need more narrowbody aircraft given the lack of growth opportunities in the domestic market. Mr Zwane told CAPA that SAA plans to take delivery of its first two A330-300s in 4Q2016, including one in Oct-2016. Both are growth aircraft and will expand SAA’s widebody fleet to 25 aircraft, including 17 A340s, six A330-200s and the two new A330-300s. SAA plans to take another three A330-300s in 2016, with deliveries staggered relatively evenly throughout the year. Mr Zwane said that SAA is now looking at returning one or two of its A340s in 2017, which will result in a widebody fleet of 26 to 27 aircraft at the end of next year. The decision to return one or two A340s has not been finalised and will depend on the network plan for 2017, which is still a work in progress. Mr Zwane said that SAA had renegotiated and extended leases by six years on seven of its 15 A340s, as part of its previous turnaround plan. Some of the aircraft which were not extended come up for renewal in 2017 or 2018, giving SAA some flexibility with its widebody fleet. Most – if not all – of the capacity growth generated by the A330-300s will be allocated to the regional market within Africa. SAA is looking at a combination of new regional routes, frequency increases and upgauging existing narrowbody flights. Mr Zwane pointed out that the A330-300s SAA is receiving have limited range from the high altitude of Johannesburg, and therefore cannot be operated on any nonstop routes to destinations outside Africa. However, Mr Zwane said that SAA is considering several potential new fifth freedom routes connecting West Africa with North America or Europe. Such routes would be within range of the A330-300, although could also potentially be operated with smaller A330-200s. SAA currently has only two fifth freedom long haul routes – a thrice weekly service from Dakar to Washington Dulles and a four times weekly service from Accra to Washington Dulles (both flights originate in Johannesburg). Accra-Dulles, which was launched in Aug-2015, has been successful whereas Dakar-Dulles continues to struggle. As CAPA has previously analysed, Dakar is a smaller local market and has not worked due to a lack of feed. SAA ended its partnership with the now-defunct flag carrier Air Senegal International several years ago, and a previous plan to establish a West African hub in Dakar through an investment in Senegal Airlines never materialised. Mr Zwane said that SAA is now looking at further expansion in Accra with a possible new fifth freedom route to London Heathrow. SAA is also looking at potential fifth freedom routes from Nigeria (Abuja or Lagos) to its two existing US destinations, New York and Washington. Mr Zwane stressed that several options are currently on the table, including possible fifth freedom routes to the Middle East, and SAA has not yet made any network decisions. Exploring fifth freedom opportunities from other faster growing African countries is logical, given the relatively limited opportunities and challenges in SAA’s home market. However, SAA needs to focus first on resolving internal issues and improving its position in South Africa. SAA losses have narrowed significantly, driven by lower fuel prices and the components of the prior turnaround plan which were successfully implemented. However, SAA remains unprofitable and will need to address all of its challenges fully in order to be sustainable. SAA needs to forge new and more comprehensive partnerships to fulfil its goal of strengthening its global reach. SAA also still requires new-generation widebody aircraft to replace its remaining A340s; SAA cannot bank on oil prices remaining low. However, SAA again finds itself in a position where it is unable to implement permanent long-term fixes to most of its longstanding challenges. SAA is essentially in limbo until a more stable political environment emerges. In the meantime SAA will need another capital injection or government guarantee, since the sale of an equity stake in the private sector is – at least for now – an unfeasible option. SAA’s future management team and board, once appointed, will face the same set of challenges as their predecessors. Turning SAA around will not be easy, and will be impossible if the government’s interventionist ways continue.